After all the holiday sweets, I'm a little tired of rich and heavy desserts. So I've been eating oatmeal and protein powder, boiled eggs and tomatoes, tuna and avocado... seems like I should be full of energy, right? But instead my body rewarded me with a scratchy throat, cough, and general feeling of ickyness. Even my teeth are aching right now. And yet it hasn't become a full-blown sick thing, just enough to make me feel really blah, want lots of hot tea, and an insatiable need for shoulder massages from Jamie. The other day, I bought a couple of big containers of red and golden cherry tomatoes, and put them on everything we made for dinner throughout the week. 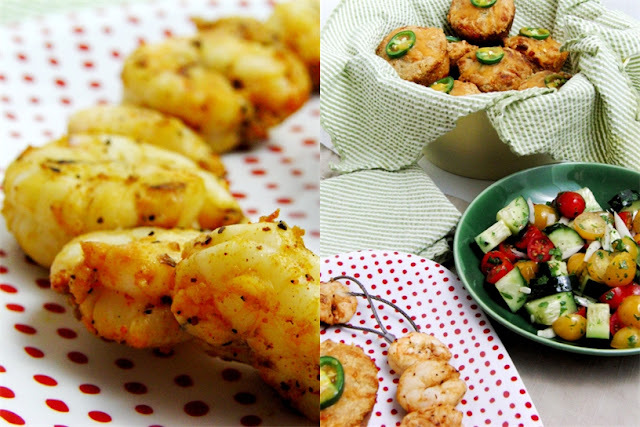 They seem to brighten up the most ordinary dinner with their color, freshness and juicy pop of flavor. 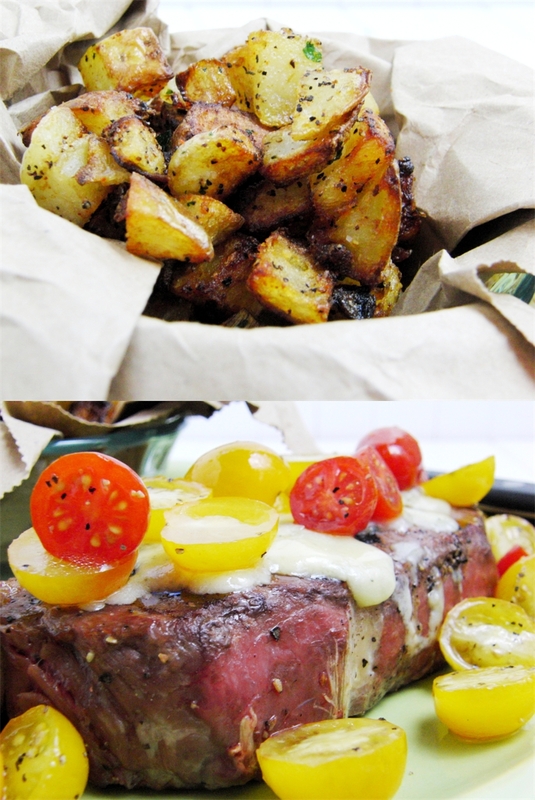 Steak with blue cheese crumbles, melted under the broiler, and topped with tomatoes, and some crispy potatoes on the side. Cucumber and tomato salad with a little onion and fresh parsley, olive oil and white wine vinegar, which we ate with some grilled shrimp. 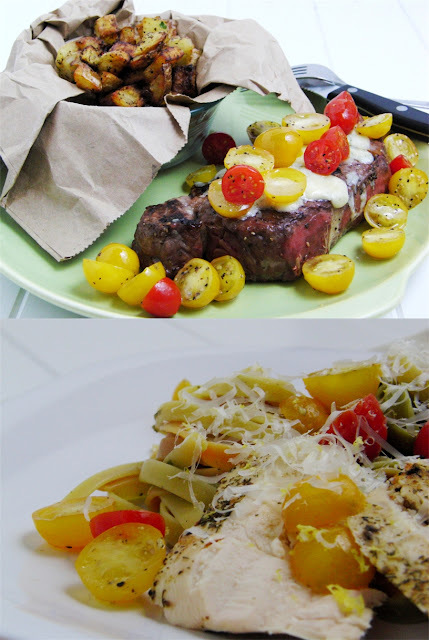 Fettuccine with pesto, lemon, tomatoes and Parmesan cheese, with grilled chicken. And to satisfy my baking addiction, without making something sugary, I baked Jalapeno Cheddar Corn Muffins. Jamie loved them so much he ate four of them with dinner, except he picked off the jalapeno slice from the top, which I thought was the best part! Cook the fettuccine in salted, boiling water according to the instructions on the box. Drain, reserving one cup of the pasta water. Return the pasta to the pot and toss with the olive oil, pesto, Parmesan cheese, lemon juice and zest, and parsley. Season with the salt and pepper. Drizzle with the reserved pasta water and toss until the pasta is coated in the sauce. 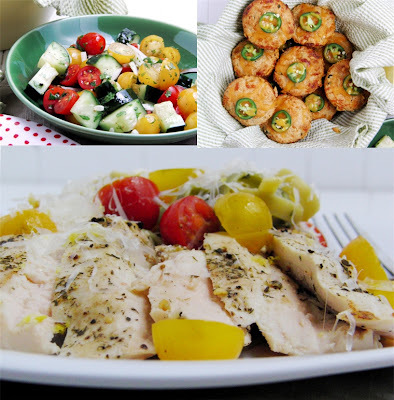 Top each serving with the cherry tomatoes, remaining grated Parmesan and sliced grilled chicken. Preheat the oven to 400 F. Spray a muffin pan with non-stick spray. In a large bowl, combine the flour, cornmeal, sugar, baking powder, baking soda, salt and pepper. In a separate bowl, whisk together the yogurt, oil, milk and egg. Pour the wet ingredients over the dry and stir just until moistened. Stir in 1 cup of the cheddar cheese and the diced jalapeno. Divide batter between 12 muffin cups. Bake for 15 minutes. Top each with the remaining 1/4 cup cheese and the sliced jalapenos. Bake for an additional 4-5 minutes until a toothpick inserted comes out clean. Transfer to a wire rack to cool slightly and serve warm. Adapted from Savory Corn and Pepper Muffins by Dorie Greenspan, Baking, page 6.